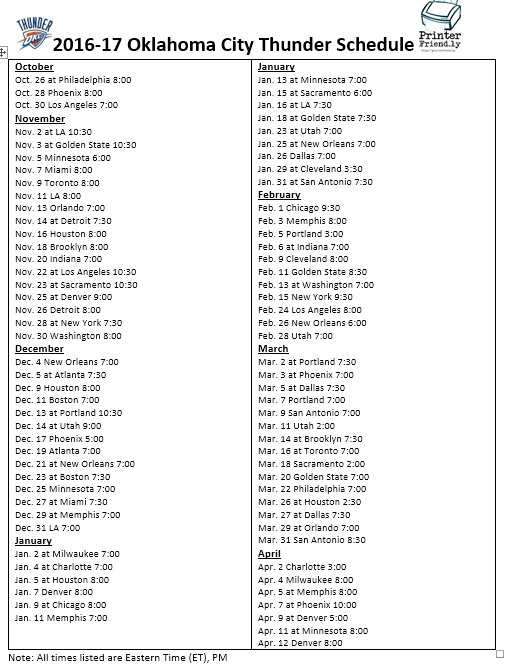 The printable 2016-17 Oklahoma City Thunder schedule is now available for fans to enjoy and to follow the regular season. This year will be the first that Russell Westbrook is free to run the team his way. The Thunder get regular season play started on October 26th at Philly. The Thunder have their home opener set for October 28th against Phoenix. OKC fans will be hoping this is the big year for their team to make a run deep into the 2017 NBA Playoffs. You can now get a free printable 2016-17 Oklahoma City Thunder schedule for the upcoming season. We have published it in both image and PDF format for fans to enjoy.